I took a few days off this weekend to drive from Chicago to Sharpsburg, Maryland where my 11-year old son and I toured the Antietam National Battlefield. We're both interested in the Civil War. Last year we visited Gettysburg. For those who don't know, Antietam (also known as Sharpsburg) took place on September 17, 1862. It was the bloodiest single one day of the entire war. Of nearly 100,000 soldiers engaged in battle, about 23,000 were killed, wounded, or missing. From a historical perspective, this battle may have been a turning point in the Civil War because it led to Lincoln's Emancipation Proclamation, freeing slaves. It also reduced the threat of England or France entering the war on the side of the South. However, as I toured the battlefield I could only imagine the courage and sacrifice of men on both sides, charging into the fire of cannon and muskets, facing certain death. While I served 3 years in the Army after college (1968-71) I was never in combat, or in serious danger. Thus, I can only admire what men and women have done throughout history, on battlefields like this, all over the world. I can also thank them for the freedom they have given us. 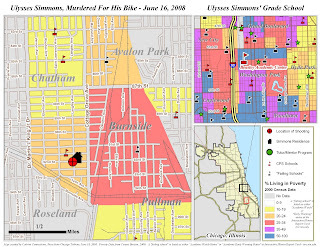 On Wednesday, June 18th the Chicago SunTimes ran a 3/4 page story titled "That boy died over a bike." This was the first Chicago Public School student killed over the summer and the 27th since January 1. These stories are creating a public outcry, marches and passionate editorials. But are they leading to the growth of programs in high poverty neighborhoods that provide extra learning, mentoring and safe places during non school hours? Can we do more than march in the streets? 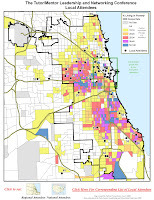 Can our faith leaders launch a learning strategy, in inner city congregations, as well as in suburban congregations consisting of people who pass through these neighborhoods every day as the go to and from their jobs in the Loop? Here's an outline of a learning strategy. To support these groups, the Tutor/Mentor Connection (T/MC) matains an on-line database of volunteer-based tutoring/mentoring programs serving youth in the Chicago region. You can search this in the Program Locator, and the Chicago Program Links. From now through the coming year, the T/MC will create at least one map each week, following news with messages of involvement and action that the media do not include when they report tragedies. We'll post these on this blog and at http://mappingforjustice.blogspot.com/. We'll also create a library of maps that visitors can use even when the media are not featuring negative news. T/MC maps will show the degree of poverty and locations of poorly performing schools in neighborhoods where the media point their bad news spotlight. The maps also will show locations of volunteer based tutor/mentor programs, if any exist. For instance in the map above, there are no volunteer based tutor/mentor programs (that we know of) in the neighborhood where the shooting took place, and only a few in the area around the school this boy attended. You can search our zip code map to find names, descriptions and contact information for organizations in these neighborhoods. If you know of other programs in this area, or if our information is out of date, you can email us and we'll update our list. If you operate a tutor/mentor program you can add and edit your own information to the Program Locator. If you want to make a judgment about which programs are better than others, view the web sites of many different programs. Shop and compare. We're not making that judgment because we think great programs need to be in every neighborhood, and that it takes many years, and consistent support from volunteers and donors for any non profit to grow to be a great program. And once you're great, it takes continued support to continue to innovate ways to motivate and inspire youth and volunteers to reach their potential. What's our purpose for creating these maps? Every day thousands of people pass through poverty neighborhoods as the travel from homes in suburbs to work in the downtown area of Chicago. These are people who control jobs, might be mentors, and have tremendous talent that could help tutor/mentor programs prepare young people for careers. 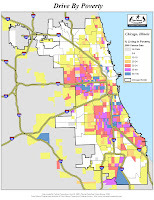 As you drive the different expressways of the Chicago region, you pass through poverty neighborhoods. Using the T/MC maps anyone who wants to make a difference can identify existing tutoring and/or mentoring programs in these areas and become a volunteer, leader, advocate or donor. Or you can help churches, hospitals or businesses in these areas launch new programs to fill voids. As more people take this role we bridge the gap between rich and poor, city and suburb, and between people of different races and religions. We make the Chicago region a better place for everyone to raise a family. 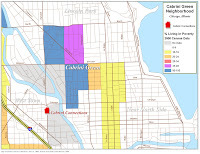 This map shows the location of the Cabrini Connections tutor/mentor program, which serve 7th to 12th grade teens living in the Cabrini Green area of Chicago. I encourage you to read Mike's article on the Mapping for Justice blog for a hear-warming recap of the event. Our Korean student interns have created a flash presention showing the dinner. You can see it here. As you read the article, or look at the flash presentation, ask yourself "What can I or my company, or church, or college, do to help make programs like this available to more inner city kids, in Chicago, or in another city?" Or, "What can you do to help Cabrini Connections continue its own program?" Take a look at the YouTube video created by our interns from Korea. It illustrates how we, connect tutor/mentor programs from many places with each other, in an effort to strengthen programs in multiple locations. 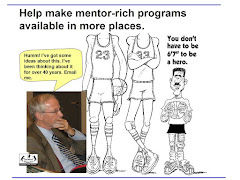 If you tell people in your own network to read this blog, or visit the sites I've pointed to, you take on the leader and network-builder role that is essential for making more and better tutor/mentor programs available in more places. Each of us has a Civic Responsibility. Marketing Solutions. 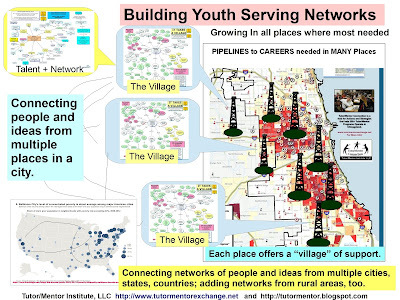 For the past week I've provided charts and graphs that illustrate a strategy for mobilizing business talent to support the entire sector of volunteer based tutoring and/or mentoring programs in Chicago, and in other cities. Last night the Cabrini Connections tutor/mentor program hosted our 15th annual year end dinner. Speakers included students, alumni, parents, volunteers and members of our leadership board. More than 150 people attended. As I looked at this group one thought went through my mind. "This is not happening in many other places in Chicago." It could be if more of our volunteers, business, faith and public leaders, adopt the ideas I've been outlining this week. This chart summarizes what I've been saying. At the bottom of this funnel is a map of the Chicago region. In the Zip Code Map on the T/MC site you can click on a zip code and find contact information for organizations that offer various forms of volunteer-based tutoring and/or mentoring. In some areas there are great programs. In others there are few programs. They all need a consistent flow of volunteers and dollars, along with a source of well-trained, dedicated staff. They are not all equally good at fund raising and marketing. This chart illustrates how leaders -- who are not directly involved in a single program -- can serve as an intermediary, connecting the people in their business, church, college, family, with the map, and thus with all of the different tutoring/mentoring programs in the Chicago region. 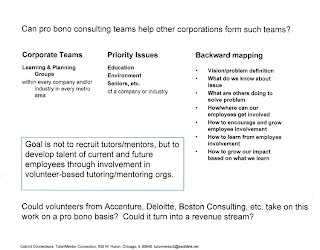 While I can meet with anyone who contacts me to help explain this idea, we'd make more progress toward this goal if I could recruit teams of consultants who would take on the role of building these teams, as part of their own probono volunteer role. When a community has leaders in multiple sectors who are evangelizing the need for civic engagement, volunteer involvement, and programs like Cabrini Connections, and pointing the members of their network to tutor/mentor programs in various neighborhoodshttp://www.tutormentorexchange.net/leadership-strategies, we share the responsibility for building great programs with the boards, staff and volunteers of individual programs. We build a city of great programs. We make it possible that in future years there could be one hundred year-end dinner celebrations in neighborhoods all over the Chicago region. Help us make this happen. I encourage you to take a look at this 3 minute Tutor/Mentor Conference presentation (flash) which was created by two student interns from Korea who have been working at Cabrini Connections for the past few weeks. This illustrates a use of talent to help a non profit tell its story. Talent like this is available in many businesses, colleges and high schools and just needs to be released in support of social sector organization. Tonight Cabrini Connections will celebrate the end of it's 15th full school year of providing one-on-one tutoring/mentoring and extra learning to 7th to 12th grade teens living in the Cabrini Green neighborhood of Chicago. Teens will be the speakers, moderators and performers. Awards will be given for leadership, attendance, improvement, etc. You can see a student and volunteer year end survey on the CC web site. The Cabrini Connections program is where the Tutor/Mentor Connection originated. Our daily efforts to build a single program led us to create a structure that would help all programs be more successful in getting needed resources to constantly innovate ways to inspire kids and volunteers to attend weekly sessions and learn from each other. Cabrini Connections is where we get our passion, and understand the reality of how difficult our work is. You can view a timeline showing the growth of this organization from 1965 till the present. While we're constantly seeking donations to fuel our work, our aim is that volunteer-based programs like Cabrini Connections are in every high poverty neighborhood of Chicago and other big cities and that some day in the future there will be hundreds of year end celebrations at this time of the year. That's the goal of this blog, which is part of the Tutor/Mentor Connections year-round strategy. That will only happen is some of the ideas I've shared for the past few days take root in business, professional, college and high school groups throughout the Chicago region and in other cities. I'll write more about this tomorrow. Let's go congratulate our teens, volunteers and staff for what they have accomplished this past year. Yesterday I talked about creating a supply chain to support multiple non profits doing similar work in the same city, or in many different cities. I concluded by saying "While we have a constant challenge of maintaining this information and supporting the technology, the real challenge is increasing the number of potential volunteers and donors who look at this information every day." While in the National Conference on Volunteerism and Community Service I heard many corporate leaders talk about how important it is to encourage employee engagement and how worker talent could be used to address important issues in non profits. I saw many examples of university-community engagement. With this chart I'm suggesting that teams of volunteers in consulting companies like Deloitte, Accenture, Booze Allen, Boston Consulting, etc. or in business schools at high profile universities, could be challenges to define this problem, and could be the volunteers who work with other institutions and corporations to help them implement this strategy. 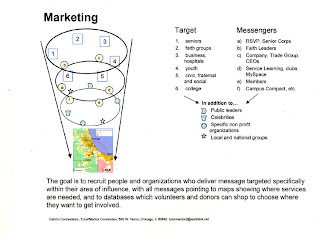 The current system puts the burden on non profits to be able to create this model, then market it with limited resources to hundreds of potential sources of volunteers and donors. It's a redundant process and only works for a few organizations with brilliant marketing leaders, and high profile causes. 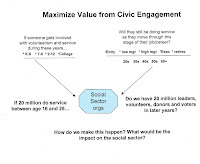 Imagine if responsibility for resource generation moved out of the non profit sector and into intermediary organizations who want to create positive public visibility, offer extra learning and networking opportunities for high potential employees, and will benefit from a resolution to the social issue being addressed. This chart outlines what I'm suggesting. Instead of recruiting a few more tutors/mentors from big consulting firms, my goal is to recruit some talented people who will become the sales force for tutoring/mentoring and who will use their consulting skills to help business and professional groups throughout the Chicago area(and in other cities) create leadership teams that encourage volunteer involvement by employees and customers, using the Program Locator and Tutor/Mentor Maps, as tools to choose where to get involved and to find contact information for volunteer-based tutor/mentor programs in these areas. This is just one way pro bono volunteers from specific industries can leverage there talent to impact the flow of resources, and the supply chain infrastructure, supporting an entire sector of non profit organizations doing work that is important to the community, and the industry. I have been in love with history since I was in 8th grade. I remember reading a 2-inch thick book about the Civil War, which was full of battle plans, in great detail. I've often admired the genius of General George Marshall, the supreme commander of US forces in World War Two. Without the aid of a PC he and his team had to visualize a map of the entire world, know where the enemy was, and build a strategy to put US and Allied forces in all of these places so the war could be won. The chart on this page illustrates the thinking that might have been needed. On the right side we see a map illustrating enemy locations. Working from right to left, we see thinking that creates an analysis of enemy strengths and weaknesses, builds US force strength, provides logistics to move troops around the world, while providing food, clothes, weapons and ammunition to all of these troops, in all of these places. At the far left we see that the war effort needed revenue, and it needed public support. To me this is a form of supply chain map. Now look at a map showing the people who came to the May 29 and 30 conference in Chicago. This map shows where poverty concentrations are highest. It also shows locations of organizations who attended the conference. 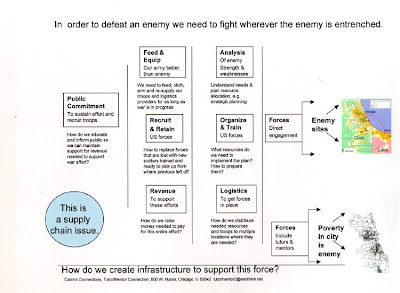 In this example, POVERTY IS THE ENEMY, and tutor/mentor programs are troops on the front lines. Each needs the same types of resources that our troops in Iraq need in order to compete with gangs and negative aspirations and win the hearts and motivation of inner city kids. We have a copy of the conference map and a list of organizations who attended on the Mapping for Justice blog. To find contact information for organizations that offer various forms of tutoring and/or mentoring in Chicago neighborhoods, click on the map in the T/MC Program Locator. With this information we can provide needed support to hundreds of organizations offering tutoring and/or mentoring in various parts of Chicago. If other cities duplicate this strategy, it can draw support to programs in their own communities. While we have a constant challenge of maintaining this information and supporting the technology, the real challenge is increasing the number of potential volunteers and donors who look at this information every day. I'll post a solution to that challenge in my blog tomorrow. I was inspired to hear former President Jimmy Carter as he addressed the National Conference on Volunteerism and Community Service last week. He talked about the gaps between rich and poor, and then demonstrated what he is doing to close this gap by providing awards to three university-community engagement projects. I toured the Carter Center in Atlanta last week and visited the web site. The only thing I did not find was a section showing how maps can be used to support the distribution of volunteers, dollars, technology, etc. to all of the places arround the world where this gap persists. The chart on this page is one that I drew as I attended workshops focused on business and university engagement. I'm trying to reverse the traditional two-way process of how nonprofits obtain resources from people who already have a self interest in wanting these non profits to be successful in their missions. We'll never have great social benefit programs in a majority of the places where they are needed based on the current system of competitive allocation. Yet, if we can engage the talent of volunteers and leaders to serve in intermediary roles, we can do more to connect people who can help with places where help is needed. I put these and similar charts on the T/MC web site with a goal that they are used by groups of people in universities, churches, businesses, etc. who want to become more strategic, and more engaged, in the ways they use their talent, time and resources to help end poverty in Chicago, and other cities around the world. I'm also looking for volunteers who will help improve the way these ideas are communicated, visually, via podcasts, animation, and using the tools that many of you know much better than I do. Read more articles showing this role of intermediaries and uses of map and charts in the Tutor/Mentor Institute section of the T/MC web site. If you know of places where discussions are taking place online with a goal of connecting networks of volunteers and donors to help distribute needed resources throughout the USA, or the world, please share links to such places via comments on this blog, or links posted on the T/MC discussion board. I created this based on my meeting notes. Last week the National Conference on Volunteerism and Community Service was held in Atlanta. I attended in my role as a Commissioner for the Illinois Commission on Volunteerism and Community Service, and as President of Cabrini Connections and the Tutor/Mentor Connection. When I attend conferences, seminars and meetings I always have a note pad. I fill several pages quotes and web references. I'm always thinking of how these ideas can be put to work in my own organization. I'm a visual thinker so I scribble diagrams of ideas, which outline ways to put what I'm hearing into actions that help us help kids. During the coming week I'm going to share some of the ideas from this conference. I'll try to post one idea each day. Today, I'll talk about the first idea, which I feel sets the stage for all others: How do we maximize the value provided by the millions of hours and billions of dollars that are spent doing volunteer service in America, or the world, every year? During the conference there were many workshops on this theme. I attended the business track, which focused on unleashing the talent withing the business sector, to support the infrastructure of non profits. Here is a copy of the idea I outlined as I listened to some of the speakers during the first day of the conference. This was my original meeting note. Above you can see what this looks like once I converted it to a power point slide. The main point of this slide is that thousands of people are engaged in National Service each year, and many more are volunteers in tutoring, mentoring and many other forms of service. If the organizations they support provide good training, good customer service, and help volunteers become bonded to the cause, many of these volunteers should stay involved with the agency or the cause, in the years after they leave direct service. 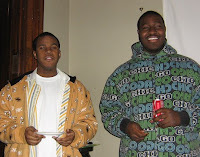 Thus, if a 20 year old youth does one year as an AmeriCorps volunteer, working with a tutor/mentor program, that youth will be more knowledgeable about the cause, and further along in his/her career ten, 15 and 20 years later. This should lead that person to be proactive in the ways he supports the cause, and in the ways he/she recruits others to also support the cause. If our service programs grow millions of leaders in industry, universities, politics, etc. such leaders can become a much more sophisticated, and powerful source of support for social benefit organizations than what we have now. For tutoring/mentoring programs, that would mean more kids succeeding in school, in life and in their future work careers. So, how do we make this happen? I'll show some ideas that I diagrammed this week. If you want to peak ahead, you can view these at in the Tutor/Mentor Institute section of our web site. I attended the National Conference on Volunteerism from Sunday through Tuesday of this week, after hosting the Tutor/Mentor Leadership and Networking Conference on Thursday and Friday of last week. One of the great quotes was from Congressman John Lewis of Georgia, who said, "We all came to this company in different ships. We're all in the same boat now." I'm just beginning to get all of my notes together and to share the information I learned from these events. However, I've started two discussions that focus on business involvement and university engagement. These include links to places like the Jimmy and Rosalynd Carter Partnership Program, and to volunteer and nonprofit impact and involvement research being done by companies like Deloitte and Accenture. In the next few days I'll post more of my ideas and begin to reach out with email to the people I met over the last week. However, I encourage you to visit these two forums and begin to look at the same research and resources that I have been looking at. As Congressman Lewis said, "We're all in the same boat." To me this means that from this common based of knowledge we can find more ways to innovate ways to work together to solve problems that we cannot solve by working alone. While I'm reaching out to you, I hope you'll find time to contact the Tutor/Mentor Connection.